In Part Four of our series tracking one school year in the lives of two early career educators, both have reached the final stretch of the academic calendar—only to focus anew on beginnings.The teachers have emerged into spring reflecting on lessons learned with an eye to continuous improvement. The words “next year” are sprinkled throughout their conversations. The same is true for MEA UniServ Director Chad Williams, who recruited the pair and others to participate in a new MEA-NEA pilot project, MiNewEd, providing additional supports to beginning educators in three northern Michigan regions. Williams is working to improve the program and to help expand its reach to Grand Rapids. 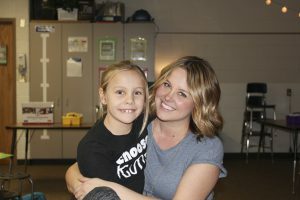 As a third-year teacher with some added experience long-term subbing, Brittney Norman didn’t expect to feel like a newbie this year—but that’s what happened when she changed districts from Cadillac to Pine River Area Schools where she lives and her daughter attends third grade. Norman laughed heartily, as she often does. She has a quick sense of humor that helps offset her intensely focused approach to perfecting her craft. Like many educators, she sometimes lies awake at night worrying about a troubled student or working out a tricky lesson plan. Norman teaches three rotations of fifth-grade math, plus she delivers the reading curriculum to her “home” group. A new reading unit on technology sparked her recent bout of insomnia, because it reminded her of teaching tools and strategies she’d successfully used in the past. One example was Kahoot!—a whole-class game-based learning platform that Norman said she had neglected this year when overwhelmed by her workload. Once she trotted it out to quiz students on fractions, the kids eagerly did the work and had fun in the process. In addition, Norman and the two other fifth-grade teachers trimmed a few minutes from other activities to make time for creative problem-solving through growth mindset challenges. That’s something she’s been doing herself—facing challenges with creativity and perseverance. As the M-STEP approached, Norman hoped to lift students by trying an online math system during free time that gives instruction and quizzes at the user’s level, with cartoon avatars and prizes to hold kids’ interest. “It’s something I found one night when I couldn’t sleep,” she said. Her biggest challenge has been classroom management. The clip-up, clip-down system used by other teachers at her new school did not suit her style. In January, she switched to sending home a “think sheet” for misbehaving students to fill out with their parents and return. But a few parents responded negatively to the mid-year change when they received a think sheet without warning. One after-school meeting with an upset parent lasted more than an hour, while Norman’s eight-year-old daughter waited in her classroom, so “Mom Guilt” kicked in, she said. “Lesson learned—I need to call home first,” she said. Now she’s using an online classroom management system—Class Dojo—that both she and her students like. So far, she hasn’t used Dojo’s tools that allow her to project student information on the board or let parents view it in real time. 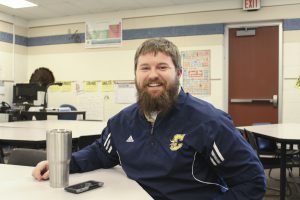 Recently sixth-grade science teacher Zack Griffin attended a professional development session at his school where the trainer seemed to be speaking directly to him. The subject was self-care. “He said, ‘I bet we have first-year teachers in here who drink a pot and a half of coffee every day,’ and I raised my hand,” said Griffin, who works at Mackinaw Trail Middle School in Cadillac. Even with the challenge of teaching a new Lego robotics class to close out the year, Griffin also has been taking time for self-reflection. Looking back on his first year in the classroom, he sees improvement in himself as well as his students. He’s been reviewing notes on his science curriculum, a new program that aligns to the Next Generation Science Standards. He likes to cull ideas from connections on Twitter. Griffin also says he’s benefited from a virtual mentor provided by MiNewEd, the MEA-NEA pilot project supporting new educators in several Michigan districts. The help he receives there from a master teacher in Pennsylvania is focused and targeted, he said. Every few weeks, he gets on a video conference call with the mentor to set goals, brainstorm strategies, and reflect on how things went after trying something new. As many as 15-20 other new educators from around the country, who are working on similar goals, might be on the call. This semester Griffin is working on increasing parental and community involvement. He wants to strengthen connection to parents, so they can reinforce at home what kids learn in school. Right now, the only contact he has with parents involves phone calls to discuss positive or negative behavior, he said. Most of those have gone well, although he’s had to develop a strategy for “disheartening” calls when a parent gets defensive or shifts the blame to him. Overall, Griffin has many positives to reflect on from his first year as a full-time teacher. He’s learned to put in the planning work that gives him the confidence to take risks. And he’s discovered more ways to connect with students, whether they make it easy or not.